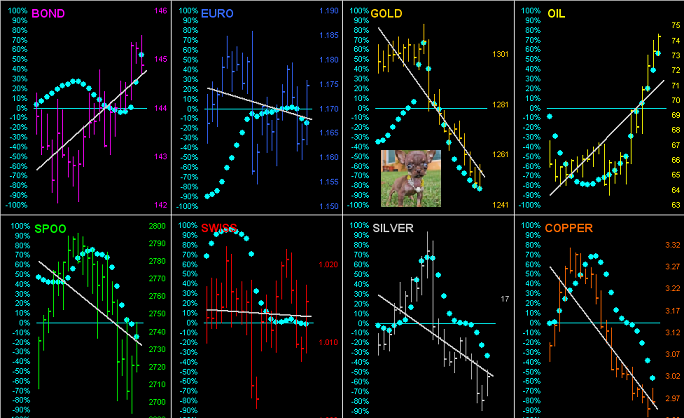 Precious metal Gold has precious little support left to save its year. Having settled the week yesterday (Friday) at 1254, price traded down through most of The Box (1280-1240), reaching as low as 1247. 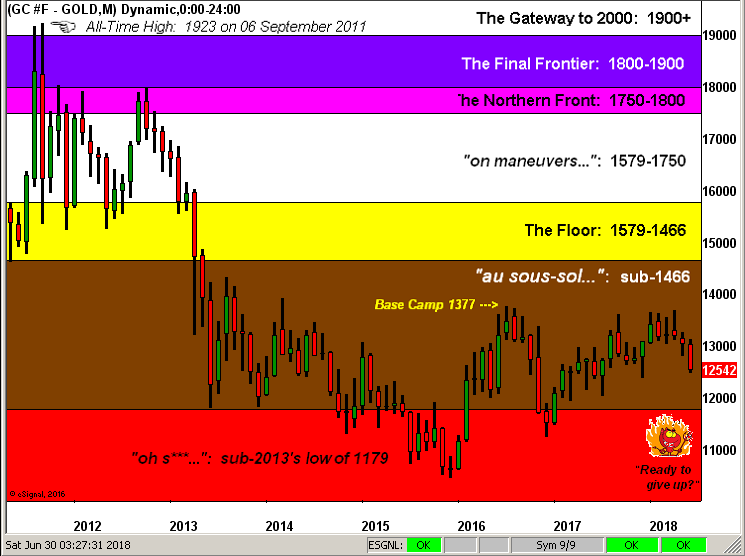 Our present sense is should Gold post a weekly close sub-1240, ’twill be well en route to putting in a down year, barring (to quote from the “The Eiger Sanction” Clint Eastwood): “…something massive, something massive…” happening to spur price back up. Indeed, the price of West Texas Intermediate Crude Oil has practically tripled in settling this past week at 74.25 from 11 February 2016’s low of 26.05. Where was Gold back on that wintry day? 1247 … as just noted, this past week’s low as well. And as herein pointed out in our prior missive, Gold also was at 1247 eight years ago. Are we having fun yet, (2011’s interim run to 1923 notwithstanding)? ■ Gold went down (you can’t make this stuff up!) from 1306.7 to 1256.4 … Are you kidding me? 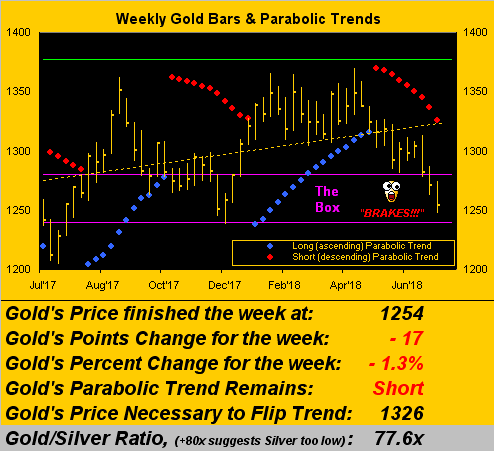 Naturally, the result of it all is Gold’s having traded well down into The Box (1280-1240) as we next see here across the weekly bars from a year ago-to-date, the red dots of parabolic Short trend stretching to accelerate Gold’s downside fate. ‘Tis time to stop tapping the brakes and instead stand on them! Do, or die, what? 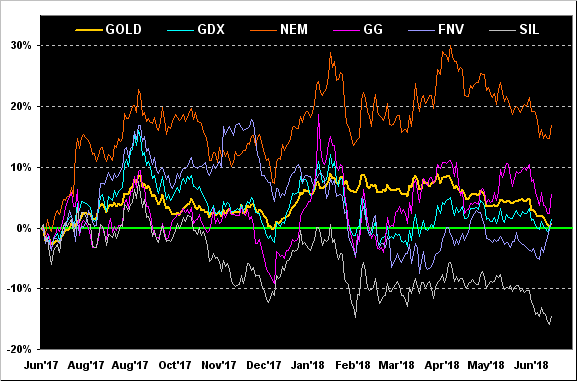 Year-over-year as well we’ve the following percentage performance tracks for Gold, +0.7%, and these key precious metals equities: Newmont Mining (NEM) +17.0%, Goldcorp (GG) +5.7%, the VanEck Vectors Gold Miners exchange-traded fund (GDX) +1.6%, Franco-Nevada (FNV) +0.9%, and lacking any and all respect the Global X Silver Miners exchange-traded fund (SIL) -14.4%. 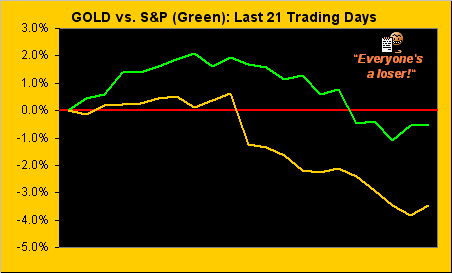 And note therein the rightmost up-blips in the equities without Gold itself participating. Did we mention this is inexplicably unexplainable? Neither overlook from the “They’re Just Figuring This Out Now? Dept.” this shock headline of the week that, according to the Congressional Budget Office: “Ballooning National Debt Could Hurt US Economy, Increase Likelihood of Crisis” We know that: we’ve known that for years. 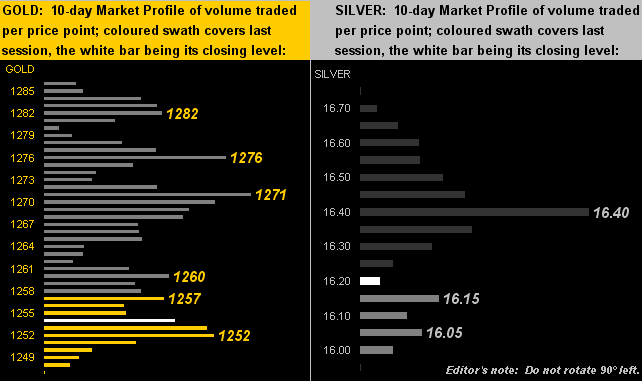 Still, with respect to Silver’s declining Moneyflow measure which we herein charted a week ago, price did succumb to the Market Rhythm Target of 15.89: so if you gutted it up to Short it down, yer buyin’ drinks all ’round. 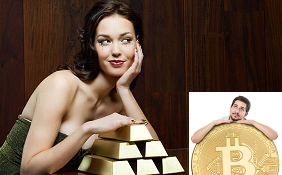 Time for Gold to hold .. and for us to hold Gold!